Let me share a quote with you that seems appropriate in the current ‘crazy’ weather climate, affecting a vast number of people across the globe. Um, firstly I think it’s rather presumptive to assume it was a man, but let’s think of the ‘he’ collectively. The name umbrella evolved from the Latin umbella – a flat-topped rounded flower and the term umbra, meaning shadow or shade. In Italian, Latin’s closest modern-day language, the term for shade is ombra and for umbrella, ombrella. Un Parasol (French and Spanish) protects against the sun, para means stop or shield and sol is sun. Un Parapluie (French) is an umbrella, para (shield against) pluie (rain). A Parachute (English, French) – para (shield from) a fall. The oldest reference to a collapsible umbrella is 21AD in Ancient China. Then we follow the umbrella, in all its forms, through the traditions and customs of dynasties such as Ancient India, Siam, the Middle East, Ancient Egypt, Ancient Greece, Ancient Rome, the Aztecs and Europe. In The Middle Ages (of Britain) a cloak, not an umbrella, was often the desired clothing against rainstorms. It would not be long before umbrellas became a fashionable item; an accessory not only to shelter from the rain but to avoid the heat of the scorching sun (the sunbeams being particularly piercing in India, for example). 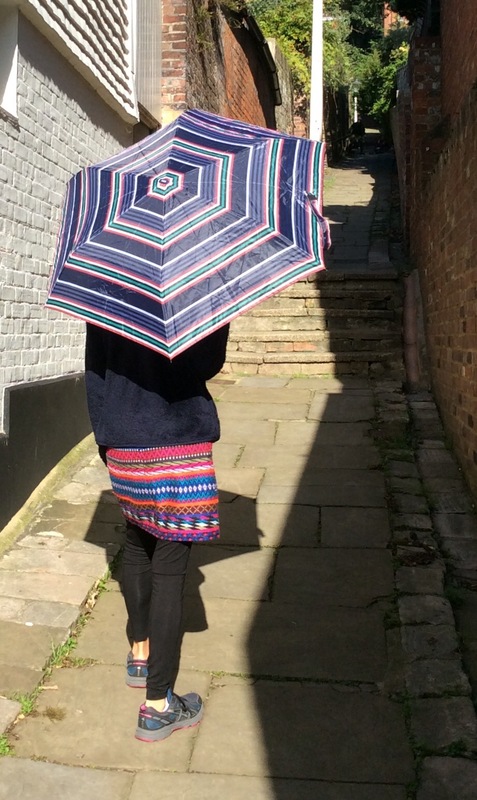 By the 1750s the British people had got over their natural shyness and promoted the umbrella’s general use. One such character, Jonas Hanway, founder of the Magdalen Hospital, dared the reproach and ridicule – the staring, laughing, jeering, hooting, heckling and bullying – of hackney taxi-cabs, of carrying an umbrella in London, everyday for 30 years, dying, nice and dry, in 1786. There is a small street in London’s Fitzrovia, leading from Oxford Street winding itself to Tottenham Court Road, called Hanway Street, reputed to be named after our man. His popularisation of the umbrella was more successful than his attempt to introduce stilts into London, keen to avoid the muck and grime of the 18th century streets. Ironically Umbrellas are the most ‘left’ items in taxi-cabs. Global National Umbrella Day is 10th February.